The Souris River crested nearly 2 feet lower than expected in Minot, N.D., where city officials hoped to ride out the high water without losing more than the thousands of homes already damaged by flooding. The river had been expected to peak at some 8.5 feet (2.6 meters) above major flood stage, but it appeared to level off as it approached 6.5 feet (2 meters) over that mark. Damage was already widespread, with Mayor Curt Zimbelman reporting more than 4,000 homes had been flooded in an evacuation zone of neighborhoods nearest the river. About 11,000 people were ordered out earlier this week. Sgt. 1st Class David Dodds, a spokesman for North Dakota’s National Guard, said the situation had “kind of stabilized” on June 25. The Souris’ channel wasn’t getting any wider. “The fact that more homes aren’t being engulfed or being touched by the water, that’s the one silver lining if you can even say there is one,” Dodds said. City spokesman Dean Lenertz said updated estimates of the flood’s toll were being prepared. The city’s water, sewer and electric power systems were still working. Workers labored to keep the Broadway Bridge, a major north-south thoroughfare, from being overwhelmed, a possibility that would divide the city in half. 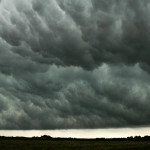 Zimbelman and others had fretted about rain in the forecast, but the National Weather Service said the storms didn’t appear to be widespread or long-lasting. Fed by heavy rains upstream and dam releases that have accelerated in recent days, the Souris surged past a 130-year-old record on June 24 and kept going. The Federal Emergency Management Agency pledged assistance to flood victims in Burleigh and Ward counties, which include Minot and Bismarck, the state capital, which has been damaged by Missouri River flooding. In nearby Burlington, more than half of the town’s 1,000 residents left late this week to escape the Souris. Sawyer, a town of about 350 people, was under a mandatory evacuation order Saturday after the Souris flowed over the main dike around daybreak. National Guard soldiers worked on a secondary levee. The National Guard activated 870 members for the crisis. Minot is best known as home to an Air Force base responsible for 150 Minuteman III missiles in underground launch silos scattered over 8,500 square miles (22,000 square kilometers) in northwest North Dakota. Col. S.L. Davis, commander of the 91st Missile Wing, said there was some “localized flooding” at a handful of missiles sites because of the wet spring and summer. But he said the silos are designed to safely handle some water and protective measures were taken at a few sites similar to what’s done in preparation for spring runoff from snowmelt.